Affordable indoor air quality monitors for the home can be worth the purchase, a recent product evaluation revealed, but all of the monitors tested by researchers were found to have either underreported or missed the presence of very small particles that can penetrate deeply into the lungs. Indoor air researchers at the Department of Energy's Lawrence Berkeley National Laboratory (Berkeley Lab) recently tested seven consumer-grade air quality monitors to see if they could detect fine particles emitted by common household activities, including cooking, burning candles, and smoking. They found that four of the monitors could reliably detect high levels of particulate matter in the air, enabling use of a ventilation system or an air cleaner to reduce pollutant exposure. The study was recently published in the journal Indoor Air. Reliable monitors could help make ventilation systems smarter by turning them on when indoor air quality (IAQ) declines – an important control feature as building envelopes become more efficient. "Not all of the monitors worked well, but the ones that did seemed to do a pretty good job, from a building control point of view," said Woody Delp, a mechanical engineer with the Indoor Environment Group in Berkeley Lab's Energy Technologies Area. "From a health perspective, where you really need high confidence in a monitor's numbers to assess an environment, we're not quite there yet." "The home IAQ monitors can be very helpful when your community is impacted by a big outdoor air pollution event like a wildfire," said Brett Singer, a staff scientist at Berkeley Lab who co-authored the paper with Delp. "After closing up the house, turning off ventilation fans, and operating any filtration that is available – including the central forced air system if it has a good filter – the IAQ monitor can give you an idea if these measures are effectively cutting particle levels in your home." In recent years, consumer-level air quality monitors embedded with low-cost optical particle sensors have come onto the market, costing less than $300 each. Similar to some expensive monitors used for research, they operate by sensing how light bounces off particles in the air -the light scatters differently depending on the size of the particle it hits. The light-scattering method is well established, but its effectiveness can vary widely, depending not only on the components used within a given monitor but on the type of pollution. 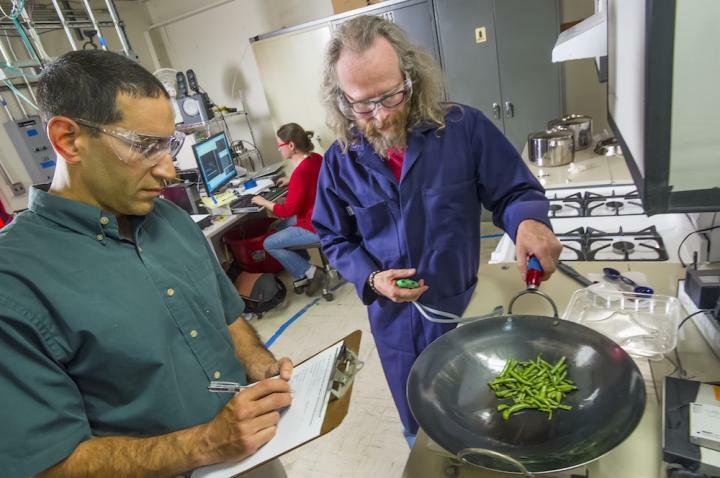 For the study, Berkeley Lab researchers conducted common household activities that emit particles: stir-frying green beans on a gas range, making toast, burning incense, and shaking a dust mop, among others. The consumer monitors cost between $199 and $280. They also tested research monitors that cost thousands of dollars. The readings were compared with two high-end reference systems and also with data from previous studies. Four of the consumer monitors – AirBeam, AirVisual, Foobot, and Purple Air II – were able to reliably detect an increase in pollution from particles with a diameter 2.5 micrometers or smaller, the inhalable fine particles known as PM2.5. However, all of the monitors faltered for particles with diameters smaller than 0.3 micrometers, which have been associated with a variety of adverse respiratory and cardiovascular health effects. The study authors noted, however, that because most sources of indoor air pollution contain both larger and smaller particles, the monitors could still help reduce exposure to ultrafine particles by generally detecting when air quality worsens and triggering better ventilation during those times. The indoor air quality landscape for consumers changes fast, with new products being rolled out and existing ones being modified. "With such a dynamic market, what's really needed is a standard test method and certification process for the industry," said Singer. "Our role as researchers is to evaluate the potential of these devices generally. Industry groups need to take the lead to provide up-to-date information as the products change and new ones come online." The study was supported by DOE's Building America Program and the Environmental Protection Agency.